Every era comes with their own distinctive identity. There are certain things that are closely associated with a certain decade. Just one look and people will instantly know what year or decade it is from. But then there are also things that look from a certain age but are actually quite modern. One good example is this Mini Vintage Bluetooth Stereo. The Mini Vintage Bluetooth Stereo is not your typical Bluetooth speaker. It is designed like a vintage sound system popular during the 60’s and the 70’s. It is reminiscent of those days when the first radios and music players first became quite popular. In those days, the byword was “Hi Fi” as in high fidelity. And it has led into many other advances since then that most people enjoy now. The Mini Vintage Bluetooth Stereo is just a reminder of how music was played back then, only in a compact and a miniaturized version of its actual size. 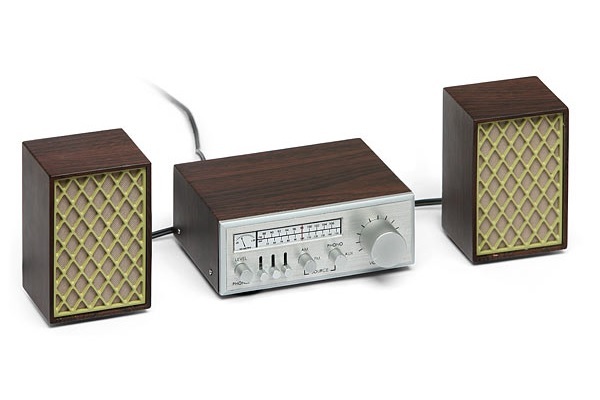 The Mini Vintage Bluetooth Stereo comes with huge knobs for controls, which was typical of stereo systems back then. And just like those times, this wireless speaker comes with a classic faux wood grain panel exteriors. But inside, the speaker system comes with a pair of 2-watt drivers which connects to the Bluetooth receiver that pairs with your Bluetooth compatible music player or device. A standard audio jack is also available if you have a music player that prefers a wired connection. The Mini Vintage Bluetooth Stereo can be your way to revisit the past but still enjoy the technology of today. This unique vintage mini speaker set is available at Think Geek for $50.